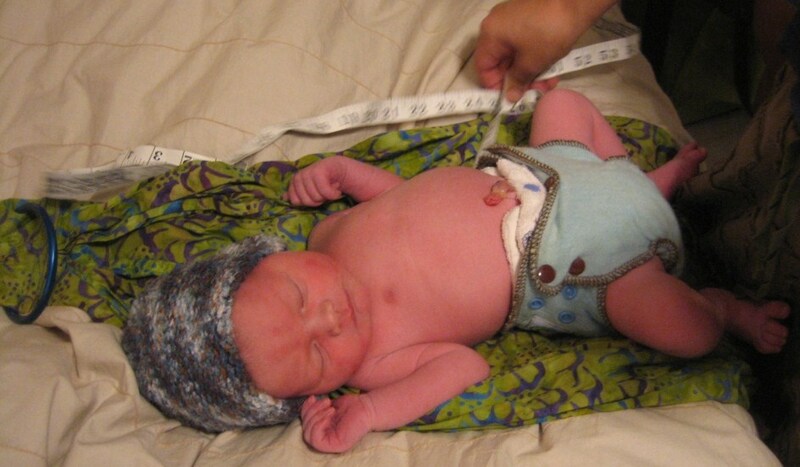 Asher Everett was born on August 10, 2010. On the day after Thanksgiving, 2009, Zach and I found out we were pregnant. We knew we wanted to have a natural birth with little or no interventions. I was with my sister when both of my nieces were born, one at a birth center and one at home. These experiences showed me that birth is natural, normal and that God has designed a woman’s body to know exactly what to do during her birthing time. A few weeks into my pregnancy I experienced some excruciating pain in my side. I wasn’t sure what was happening so I went to my OB. After an ultrasound, I found out a cyst had ruptured on my ovary but my baby was doing fine. That was reassuring since I had another cyst rupture a few weeks later. I continued regular visits with my OB knowing I was not planning on delivering at St. Francis, the only place my doctor delivered. At the same time, I was not sure what I was going to do. I actively searched for other options and Zach and I prayed for God’s guidance. I didn’t like what I heard about the Labor and Delivery units in most of our local hospitals. We interviewed my sister’s top medical choice, Dr. Stafford, to get a feel for what delivery at Greer Memorial would be like. To be honest, though I loved Dr. Stafford’s willingness to offer choice to his patients, I didn’t like the idea of being a “patient” and dealing with hospital protocols. I met Carey Collins, a local midwife. We met for a yummy lunch and a two hour interview. I felt at ease with Carey instantly. I loved her philosophy of prevention verses intervention when it comes to birth. I loved how she listened to us, answered questions we had, and took so much time with us, which we weren’t used too (even with Dr. Stafford). Fifteen minutes tops with most doctors, but Carey wanted to get to know us and understand what we wanted in a birth. She talked to us about options. At week 20 of my pregnancy we switched care providers from my OB group to Carey Collins. I was so pleased with her prenatal care and her availability to us. She often came to my house on Saturdays for prenatal visits so I didn’t have to use my sick leave at work. She cared about my diet and nutrition as well as my emotional health. We also opted to have a certified nurse midwife attend the birth since she could suture or offer IV fluids if I became dehydrated. These were two concerns I had and didn’t want to be transferred to a hospital for either. I continued to have a normal, healthy pregnancy so there was no reason to believe I would need to have a hospital birth. Most births are natural and normal though the hospital c-section statistics both nationally and locally don’t show that to be the case. August 6 was my “guess date” for Asher to be born. This turned out to be my last day of work. From mid July on, every day I came to work someone would say, “You haven’t had that baby yet?” as if I was supposed to have him early when most first-time mom’s go over their “due date.” Since the workload was intense and I also needed some time to mentally prepare myself for having this baby I made Friday, August 6th my last day of work. This turned out to be a good decision because I had all day Monday August 9th to catch up on my Hypnobabies homeplay, nest a little more, and mentally prepare for a homebirth. At about 11 PM on August 9th, I had “bloody show.” Seeing that much blood after not bleeding for 9 months was shocking and I started shaking wondering if everything was ok. I was also having some cramping that was inconsistent but uncomfortable. I called Julie and she reassured me that the blood was normal. What I didn’t know about bloody show was that I would continue to bleed small amounts from that point on. The pressure waves continued that night. I tried to take the advice of my Hypnobabies instructor/doula to ignore early signs of labor so not to psych myself out and stop the progression with anxiety which produces adrenaline. Unfortunately, I was too wound up to sleep. At 3 am I took a bath hoping to ease the niggling discomfort in my back and relax enough to rest up for the big day. It helped a little but I still could not sleep. It was just too uncomfortable to lie down so I finally got up. I got nervous the next morning when I was still bleeding so I called Carey. She reassured me that the blood was normal and asked if I wanted her to come over. I said yes, knowing I was probably wasting her time and was only in the early stages of labor, yet she never made me feel like I wasted her time. She came out and monitored the baby’s heart rate both during a pressure wave and after. I was assured when she told me his heart rate was perfectly normal. The blood was no reason to be alarmed. She checked my cervix which was 2 centimeters dilated at that time. I was thankful I had dilated a little. Carey reminded me that every bit of pressure was working whether it was getting Asher into optimal position or opening my cervix. I frequently reminded myself of this fact throughout the process. Carey told me to take it easy by napping or watching a movie. So I tried. Lying down was too uncomfortable and it was hard to focus while watching a movie. Finally at 4PM I asked Zach to call my doula, and sister, Julie. I needed her present. The pressure waves were still irregular and lasting only about 30 or 40 seconds but the back pain was becoming intense. Julie suggested I do the rotisserie (2 pressure waves on each side, 2 on hands and knees and 2 on my back) while we waited for her arrival. She was sure Asher was posterior and we needed him to turn anterior. The rotisserie was intense. She quietly arrived and did a few tricks to help the pressure waves increase in frequency and duration. Once I finished the rotisserie she made me do it again. I was not happy about this. Two pressure waves on your back is really uncomfortable! She encouraged me to listen to a hypnosis script. I really didn’t enjoy listening to the scripts. Also, they talk a lot about deserving an easy and comfortable birth. I had trouble with this language because I knew people who didn’t experience an easy and comfortable birth and I didn’t feel as if I deserved something more than others. I also struggled with the inner power discussed as if I had complete control over every aspect of my labor, baby’s birth and health. That’s a lot of pressure! Though I believe we have some control over these things I disagree that I can mentally “make” my birth go according to some predetermined plan. I personally trust in a Person greater than myself, one who has all power, and I leave a lot of these factors in His hands. The one tool I had been using pretty regularly from Hypnobabies was the tool of picturing every pressure wave as a literal wave that peeks and then descends. This helped me not to tense and fight the wave but to tell myself that once it gets unbearable it will descend. I imagined swimming on each wave and telling myself that maybe this time my water will break, maybe this time my baby will descend, maybe this time my cervix will dilate. This was helpful. I went into a zone while I listened to the script and surprisingly I rested while doing the rotisserie. The last words of the script were “open, open, open.” When I opened my eyes, my teeth began to chatter. Julie said, “Why are your teeth chattering?” She thought I was scared of something. No sooner had she asked the question than my water broke. The question was answered. Your body releases a flood of adrenaline just before your water breaks which is why my teeth chattered. It was about 7PM and I moved into the tub at that point since my pressure waves were coming more regularly and lasting longer. The back labor was intense so the warm water was a relief. I had Zach apply counter pressure to my back which helped. We were certain my back would be bruised from all the counter pressure. While in the tub I paid attention to nothing but my breathing. I tuned out everything else. Zach prayed over me and I silently called out to Jesus for help. He recited scripture from the Bible to me and I silently recited parts of Psalm 139 which I began memorizing before my birthing time. This gave me peace. God’s presence was near the entire time reminding me to marvel at the miracle of new life. I was feeling the urge to push so Julie reached for her phone to call Carey. I didn’t notice that she dropped her phone in the tub. I didn’t notice how she frantically searched for one of our phones to call Carey. When she finally got the number and called Carey, Carey’s phone died before she heard Julie tell her that it was time for her to come. As time passed I looked at Julie and said, “Carey is coming, right?” And she just looked at me and said “Mmm hmmm.“ Thankfully Carey has good intuition and made her way to my house which was about an hour away. She arrived just in time. Due to bleeding during pushing she thought I was pushing against a cervix that had not totally dilated. She offered to check me and I was happy for her to do so, because honestly I thought I would have had the baby by now or at least feel his head crowning. It was about 8:30PM. I was completely dilated but I had a cervical lip. She could tell that the baby’s head was not in the optimal position so she pushed his head back up so he could re-engage in the correct position. She tried to hold the cervix out of the way as I pushed through a few pressure waves which was terribly uncomfortable. When the nurse midwife arrived she checked me and assured me that I could push this baby through, I was just going to have to push past the painful spot. So with all my might I pushed that baby and he eventually moved past the swelling pain. I asked Carey what I needed to do to get this baby out and she told me to listen to my body so I tried several positions. Nothing was comfortable at this point. She asked me if I wanted to get back in the tub and I said no. She asked if I wanted to get in my bed and I said no. I didn’t want to move. Nothing seemed to make me comfortable and I was so tired. One of the most helpful things said to me was by Julie. She said, “You are not broken, you can move.” It occurred to me after she said this that I did think I was broken, that something was terribly wrong since I was experiencing this type of pain. Carey encouraged me to lay back and rest. I ended up giving birth to my son in the exact position I didn’t want to, lying on my back! But it felt so good to lean back against Zach and rest my legs. After two hours of pushing, Asher’s head was out. I expected the body to come out shortly after. This is what I observed when my nieces were born, once the head comes through the shoulders follow quickly afterward. This was not the case with Asher. “What’s wrong?” I asked Carey. Asher’s arm was behind his back and she could not move it. He was not stuck but it was difficult to push him out. Though I did not tear when his head came out, I had to push his body out with one arm behind his back which did cause some tearing. Thankfully, Jackie Robins, my nurse midwife was there to stitch me up so I didn’t have to be transported to the hospital for this minor procedure. Asher was born at 10:22 PM. He weighed 8lbs 4oz and was absolutely healthy and beautiful. I was so amazed at how alert he was. He was trying to raise his head and look around from the moment he was laid on my chest. It was so incredible to look at this tiny little baby made from two cells from two parents, given life by God. I was able to give him his first bath that night. We crawled into the bathtub together and took a warm bath. It was so special. Everyone stayed around until 2am. We ate, talked, took pictures and laughed. I barely slept that night. I just kept looking at Asher and listening to him breathe. Asher slept well, I know he was tired! It was wonderful. I had such an amazing and supportive team around me. Carey came back the next day to check on both of us. She and Julie helped me with breastfeeding. Carey came back again on day 3 when my milk came in and I was a tearful mess. She reassured me and comforted me. She came back at one week, two weeks, four weeks and Jackie came back at 6 weeks for a checkup. Both she and Jackie were available any time I needed to talk day or night. The postpartum care was unbelievable. I would do it all again in a heartbeat. I felt supported by family, caregivers and friends. In addition, I trusted my caregivers 100% and knew that they had both my and Asher’s best interest in mind! I praise God for Asher’s life and an incredible birth story! What a lovely birth story with a patient and courageous mama and wonderfully supportive sister and doula. Thanks for sharing! !